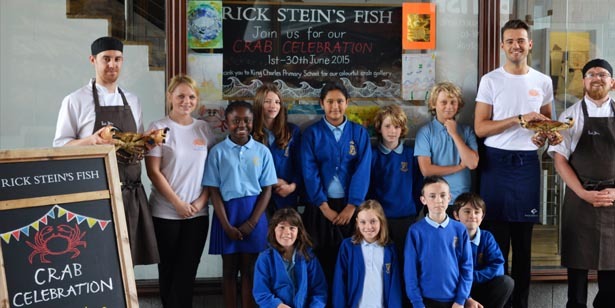 Rick Stein’s Fish in Falmouth and King Charles Primary School have joined together in an art competition to mark the start of our crab celebration this June. The competition has already seen a host of pupils from across the school get creative entering their collages, paintings and drawings after we challenged them to enter their best crab themed artwork. Year six creative ambassadors from the school joined our team of chefs this week to get up close to some live crabs to help inspire their entries for the competition. The competition has marked the start of our crab celebration at the restaurant this June. As well as an exciting crab menu including dishes such as Malaccan black pepper crab, Maryland crab cakes and crab linguine there are crab recipes, fun facts, competitions and more. We will also welcome a performance from sea shanty band ‘Swinging the Lead’ on Sunday 14th June at 7pm during Falmouth’s International Sea Shanty Festival. The winner of the competition will be chosen at the end of the crab celebration and will receive a family meal at Rick Stein’s Fish. You can see all the artwork on display at Rick Stein’s Fish throughout our crab celebration this June. Click here for more information on our crab celebration or follow us on Twitter or Facebook.